Greetings, Heroes of the Mists! A while back, I laid down a road map of the vision of what was to come from Player vs. Player. We’ve completed everything on the road map and much, much more, unifying PvP gear with the rest of the game and replacing a complex PvP-only rewards system with reward tracks that give you the power to choose which rewards to work toward. We created a safe environment where players could play for fun with their friends in Unranked Arena and delivered to you high-end competitions with cash prizes in the ESL cups. Our global tournament, the World Tournament Series, has given top players a chance to travel the world and win big prizes. But there’s one piece missing in our vision of PvP—one feature on that road map that was to serve as a place for beginning PvP players as well as up-and-coming PvP talent to compete, see progress, set goals, and be rewarded. We have regular competitive events for our top PvP teams; now we’re adding a system that allows everyone to compete and be rewarded. 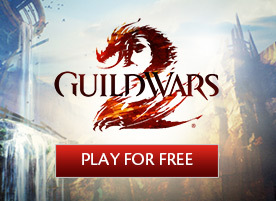 I’m excited to announce our PvP League feature for Guild Wars 2. 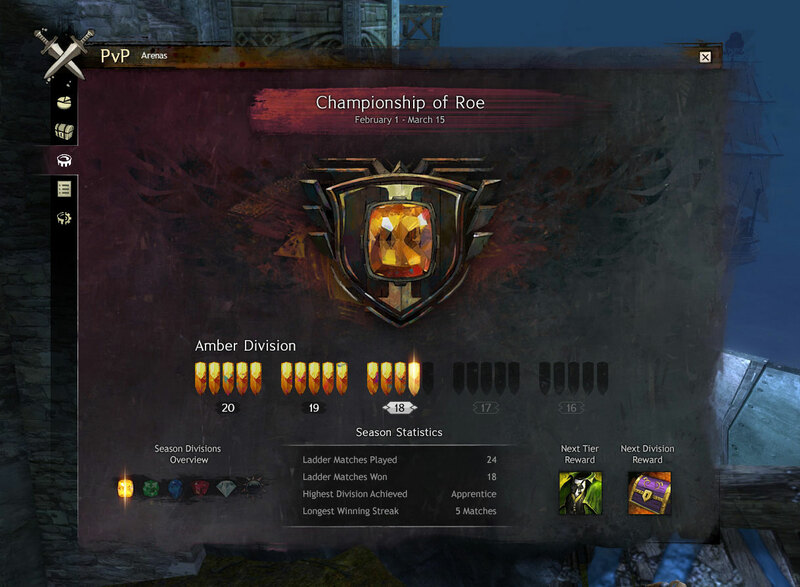 In Guild Wars 2: Heart of Thorns™, PvP will have regular league seasons. During a season, players begin in the starter division and earn their way up to the next by defeating other players within their division, earning rewards and gaining prestigious items along the way. 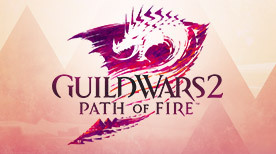 PvP leagues will give players of all skill levels regular goals, better matchmaking, and unique rewards, and they’ll provide a better system for ranked play in Guild Wars 2. There are six divisions in PvP leagues. These range from division one—the Amber Division, where everyone starts out—all the way up to the Legendary Division, providing a place for all skill levels to match up against similarly skilled players as they improve their abilities and work their way up into the next division. Divisions are broken up into a variable number of tiers, and each tier has several pips. To rise a tier, you must earn pips. Winning a match guarantees you a pip, and in some cases you won’t need to win—you’ll simply need to beat a required score threshold if you’re matched against a team outside your skill bracket. To cross into the next division, you must complete all the tiers in your current division. For example, division one has three tiers with five pips each. When you win five matches, you move up to tier two. Gain five more, and you’re at tier three. Do it again, and you advance to division two. Crossing into a new tier for the first time in a season earns you rewards, and bigger rewards and prestigious items are awarded each time you make it into a more advanced division. Division one, the starter division, will only award forward progress. Just getting started? Lose a match? Don’t sweat it; keep at it, and you can get through division one. After that introduction, winning begins to matter more. In divisions two and three—the intermediate divisions—you can lose pips by losing matches, but you can’t lose tiers. Divisions four and five—the advanced divisions—are where competition really heats up, and from that point forward you can lose both pips from losing matches and tiers after you’ve lost all the pips in a tier. You’ll never go back to a previous division during a season however, so if you’re having a bad streak, there is a limit to how far you can fall. The final division is the Legendary Division. 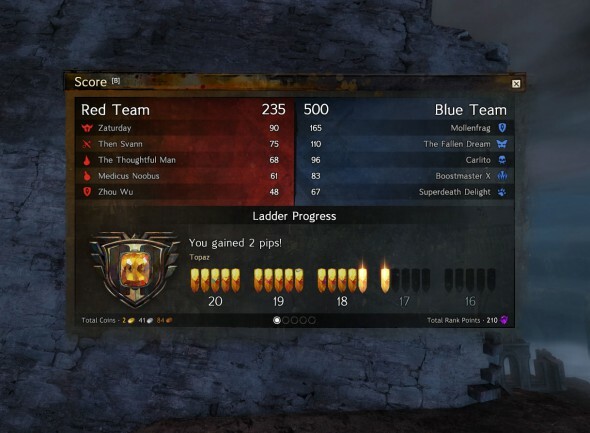 It’s a repeatable division that gives players a chance to climb as high as they can and earn rewards each time through. It isn’t enough to be one of the best if nobody knows it, so leagues will offer you badges for your nameplate. Crossing over into a higher division will upgrade your badge so that every Tyrian can admire your talents in combat. It’s important that seeing someone with a high-ranked badge means that person is currently a top player, so badges are earned for each league season. You can show off where you are in the current season and for a short break between seasons, but once the next season kicks off, badges reset and each player must prove their worth by earning their standing for the new season. While earning badges is seasonal, anyone who makes it into the Legendary Division will earn a permanent title to show off this major accomplishment for all time. In addition to badges showing your current standing and titles to show that you made it to the top, all players will have the opportunity to work toward a progression of back items, earning the Wings of Glory. Crossing into a more advanced division will earn you League Tokens. These tokens can be exchanged for the first level of wings, and additional tokens can be exchanged to upgrade your wings to progressively more awesome levels. In the future, new items will be added that can be purchased for League Tokens. 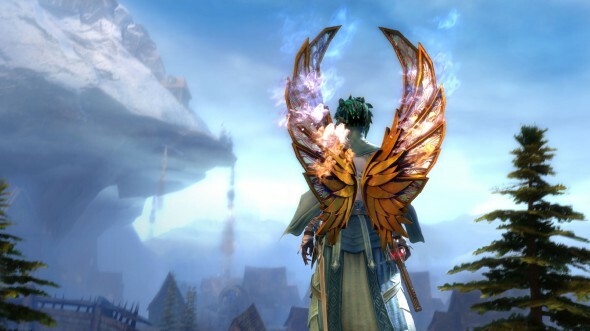 The newest items will always be offered at a discount, so make sure to earn your glorious wings while they’re the hot new item in PvP leagues. In addition to Wings of Glory, we’re adding a new unique item you can earn for competing in PvP leagues—a legendary one! Participating in league play will allow you to begin a journey toward building an entirely new and unique legendary back item. You’ll begin by gaining the ability to build the collection for the precursor; later, you’ll build that precursor into a legendary backpack, the Ascension. Though this new legendary item will focus on having players earn rewards from competitive PvP, it will also require attaining other items that go into the final collection to build it. In order to help keep league play fun for all players and reduce the number of people who quit, go AFK, or get up to other shenanigans, we’ll be updating and reinstating the dishonor system. The dishonor system gives a timeout to players who disrupt others from having a great match. For more information on the dishonor system, check out the blog post here. With Guild Wars 2: Heart of Thorns, we’ll be introducing our brand-new feature, Guild Teams, which will include guild team leaderboards for PvP. Guild team leaderboards will make their debut with PvP leagues, and they’ll be active during all PvP League seasons. This leaderboard will be based on the Elo rating system as a skill-based comparison between teams. Playing as a guild team during a league season will adjust your rating, and that rating will be shown on the leaderboard. Ratings will decay with time, so inactive teams will not be able to hold top spots on the leaderboard. Though PvP leagues reward individuals immediately for completing tiers and advancing divisions during a season, our new PvP guild leaderboard is all about where your team is ranked on the leaderboard at the end of the season. When a season ends, teams will receive rewards based on the team’s placement on the leaderboard. We’ll also be using our leaderboards from each competitive season to help determine which teams will receive invitations to higher-tier tournament events. 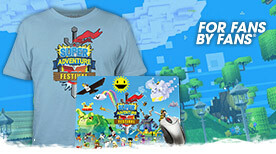 For more information on guild teams, check out the blog post here. We’re thrilled to be bringing you the PvP League feature in Guild Wars 2: Heart of Thorns. It’s been one of the last key pieces to the structure of PvP that gives players of all skill levels a chance to improve, advance, earn their place among the heroes of the Mists, and have something to show for it. We’re looking forward to crushing our opponents (in friendly competition), standing atop their bloody helms (in the air of good sportsmanship), climbing to the next division, and then casting their corpses away (all in good fun).